The late comeback was nice. If you actually watched that far, then you were at least rewarded. But overall there was very little worth watching in the Bills-Bears game Thursday night. With a chance to really give us all something to talk about, veteran quarterback A.J. McCarron only had us asking the question in the headline. I’m not putting too much into the late comeback. The fourth quarter of the fourth preseason game is about as significant as postgame pickup football game in the parking lot of Soldier Field. Minus the Old Style. The first signal that his status is way up in the air came when McCarron was picked to start this game, and slated to play the entire contest. To me, that’s not a ringing endorsement of what McCarron has done or what the Bills think he can do. If he was valued higher by the front office, the Bills could have signed a fourth stringer to play the game. Yes, missing Sunday’s game with a shoulder injury would be a reason why McCarron needed the snaps, or the Bills wanted to see him take the snaps. But I think it’s an indication that his status on the roster is in serious jeopardy. I don’t say that because of the way he played for most of the game. Throwing him out there with the second and third strings is a near-impossible task. But as a fifth year player, he should be able to raise the level of the players around him. At least a little. Instead, McCarron made bad decisions early in the game like the interception returned for a touchdown. He didn’t react well to the pressure and got sacked 5 times. He threw one really nice pass, the TD to Robert Foster. He played better late in the game. But overall, he never looked like the only veteran on the field. He should have. 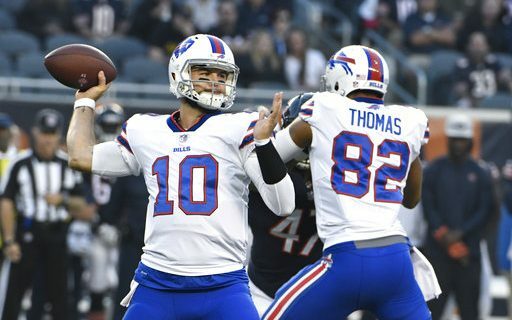 So now, with roster decisions to come in the next few days, the questions about his status and the Bills desire to keep three quarterbacks is a big one. He’s a veteran, who has been in the league for four years and started four games. That’s more years and starts than Nathan Peterman or Josh Allen combined. That veteran presence can be valuable. Right now, that’s the only reason to keep McCarron. Can he be a benefit to Peterman or Allen, whichever earns the start? Can he be the guy who’s on the sideline after a series helping those guys with what he sees? Can he help make them better? Spending four years as Andy Dalton’s backup tells me that he’s experienced with that role. NFL people have told me he has the perfect demeanor and mindset to be a good backup. That’s important. It’s why guys like Matt Cassel have been in the league as long as they have. There is a value in that. As for the salary cap, according to Spotrac, keeping McCarron only costs the Bills $3 million on the cap. That’s nothing for a quarterback, even a third one if you consider what the Bills are paying for the position, which is under $7.5 million. Most teams, less than half, keep a third quarterback. Coaches think the roster spot is too valuable to keep a player unlikely to play and unlikely to help. Maybe the Bills view it differently, with their young and untested QB position. But it will be a hard discussion, especially if there’s a young player the team likes for the future and doesn’t want to expose. That could be a receiver like RayRay McCloud or cornerback like Levi Wallace. If the Bills feel like their offensive coordinator Brian Daboll and QB coach David Culley will be the veteran sages for Allen & Peterman, then why keep a veteran quarterback? Can McCarron really provide that much knowledge? Or would Sean McDermott prefer that his coaches do that? Under what scenario would McCarron play? If Peterman starts, then Allen will be the #2 and ready to go in at some point. If Allen starts, Peterman gets the backup spot. Other than both being injured, what could possibly happen to have McCarron play? If it all goes bad, then it will become time to let Allen learn, not have McCarron try to win games. Cutting McCarron would cost the Bills a total of $5 million, $3 million this year and $2 million of dead cap money next year. I don’t think that’s enough to effect the decision. The only way it does is if Brandon Beane says I don’t want to waste the $5 million I have already paid McCarron. What Will The Bills Do? I don’t see the reason to keep him. He’s not good enough, not expensive enough and not important enough to keep. A third QB seems like a luxury to me. But because they’ve already paid him, because the position so young, and because the jury is out on whether Nathan Peterman is even good enough to hold the job until Allen is ready…I think the Bills will keep McCarron. Just as an insurance policy. *McCarron’s start tells us one thing. The QB race is down to two. It will either be Peterman or Allen who starts against the Ravens. We already really knew that, even though nothing has been said by McDermott. *A list of the players who sat out this game is the list you’ll use to start filling out your roster. Those are the ones the Bills are counting on. Among the notables on that list are Jason Croom and Andre Holmes. *They guys who did play are clearly on the bubble. Adolphus Washington, Tanner Vallejo, Rod Streater, Nick O’Leary, Logan Thomas. *All that talk of how players can win spots in this game? Did anyone do anything that you saw that made your think that? Of course, the game tape may say something about lineman or coverages. Defensive back Siran Neal, with 10 tackles, is the only who did anything in this game that would make me say the earned a spot. *Thankfully, the preseason is over. Bring on the regular season.